Ace of Spades - Intermarkets Inc. Ace of Spades HQ is a conservative, humor-driven U.S. political blog. It covers current events, legal issues, and a range of popular culture topics. 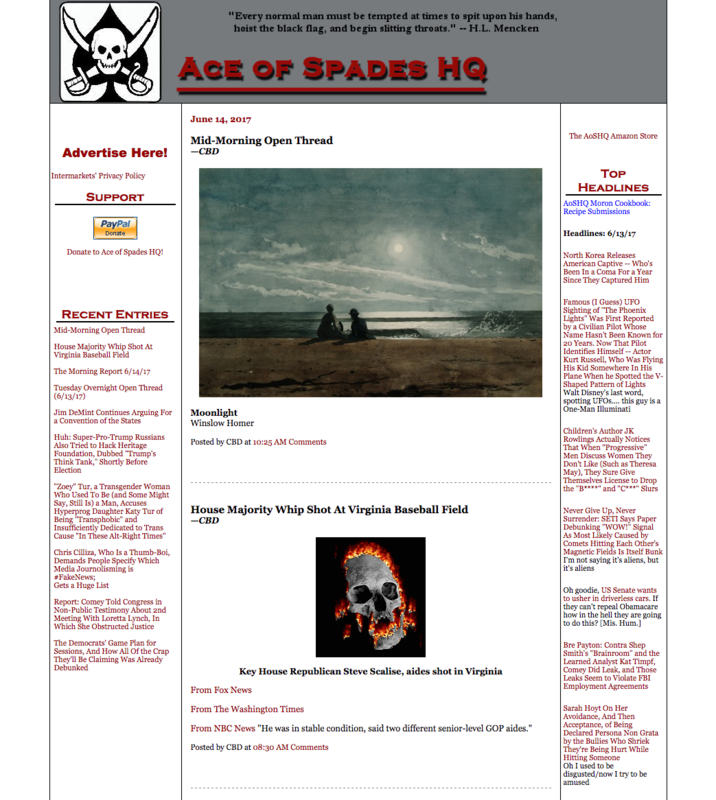 Ace of Spades HQ has also been quoted, mentioned, and referenced on The Wall Street Journal's website, Fox News, CNN, National Review, The Weekly Standard, and many notable online magazines. The American Conservative Union's Conservative Political Action Conference (CPAC) named Ace "Blogger of the Year" in March 2008. The Ace of Spades HQ audience is smart and engaged. You’ll have ample time to get noticed by these readers because they spend over 3 minutes on the site to catch up on the latest political commentary. 80% of the traffic is direct so they are dedicated and come back day-in and day-out. Ace of Spades’ readers respond to political campaigns and causes, technology developments, and lively discussions. Reach these loyal, engaged audiences. Contact us about advertising opportunities today. Copyright © 2018 Intermarkets, Inc. All rights reserved.